The Riverbank Army Ammunition Plant (RAAP) Base Reuse Plan provides a clear vision and a roadmap for the future redevelopment of the facility. 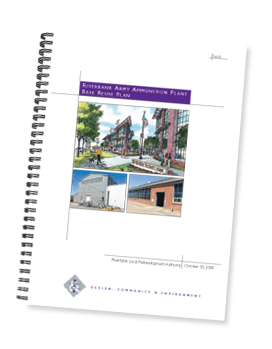 The Reuse Plan contemplates the site as an economic development engine for the City of Riverbank and represents the culmination of a three-year public process to determine the RAAP’s future. The Reuse Plan was submitted to the Department of Defense for review in November 2009. The foundation of the Base Reuse Plan is the retention of current business tenants and an agressive recruitment of new business tenants to the developed and undeveloped portions of the site. At buildout, a diverse mix of traditional manufacturing and new “green” businesses are expected to share the site along with an offering of small office suites and limited convenience retail. Attraction of new energy industries and other ”green” businesses is at the top of the priority list. Green businesses generally focus on servicing or manufacturing products that reduce global warming, or using “green” practices to make products that fulfill traditional consumer demands. Considering the current public policy and the growing trend toward sustainable practices, RAAP has the potential to become a highly desirable and successful facility for green industries in California. Copyright © 2012 Riverbank LRA. All Rights Reserved.